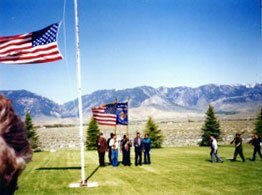 Bennett Butte Cemetery District #1 offers gravesites and cremains sites for residents and non-residents. For a list of fees associated with reserving a gravesite and the opening and closing of graves and cremains, click here. To view a map of the gravesites, click here. All caskets must have an outer covering of metal, concrete, fiberglass or PVC plastic. At time of a burial/cremation a temporary marker must be provided by the funeral home at a cost to the family to mark the gravesite. A permanent marker must be placed on the gravesite within one year. a $100 deposit payable to Bennett Butte Cemetery District #1 is required from the family or executor of the deceased prior to burial/cremation to be held to insure a permanent maker is installed. After this has been accomplished, the deposit will be returned – otherwise it will be used by Bennett Butte Cemetery District #1 to install the temporary marker in concrete with the name of the deceased. The funeral home will collect the cost of grave opening and closing, as well as the $100 deposit for the stone marker which will be transferred to the Secretary/Treasurer of the Bennett Butte Cemetery District #1. This also applies for a cremation. If at any time a “Grantee” (holder or their heirs) of any plot is no longer of the Bennett Butte Cemetery District #1, then the plots will be subject to the return of ownership to Bennett Butte Cemetery District #1. This would be the responsibility of the “Grantee” or heirs having a grace period of 10 years past purchase. Bennett Butte Cemetery District #1 © 2019. All Rights Reserved.